Republished with permission courtesy of the Winnipeg Free Press. "Building owner opposes heritage designation" has become a regular headline in Winnipeg over the past few years. One by one, buildings are being nominated for designation — the Bay, the Manitoba Club, the University of Manitoba — and, one by one, owners are trying to fight it. 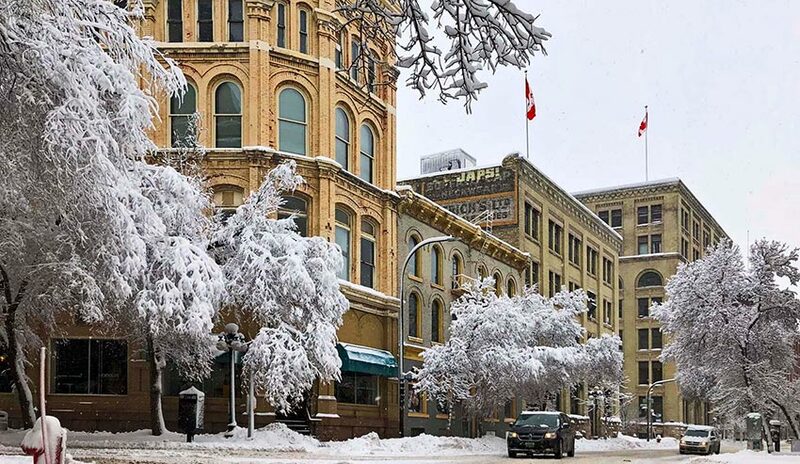 This streetscape in Winnipeg’s Exchange District presents a pretty winter picture, but it also illustrates the value of preserving and protecting heritage buildings. The process of renovating an office is both daunting and exciting. The reward of a transformative new workplace is delayed until the design and construction process is completed and the myriad of logistical details are executed. And, before the new space can become a reality the old one must go. A group of Number TEN Winnipeg staff were sent down the street to the old workplace at 115 Bannatyne Avenue to help speed up the demolition process. With some coordination and assistance from our Workplace Interiors design team and contractor J&J Penner Construction, we entered the old office setup for one last time. As you can see, it was a total blast! Number TEN’s Winnipeg new office construction will run from March 4 to August 1st, 2019. Once complete, we’ll return to the same location in the heart of the Exchange District. In the meantime, our Winnipeg team is working down the street at our temporary office – Camp-10 – at 200 Waterfront Drive. Stay tuned to numberten.com and our social media pages for more news and updates on our innovative workplace renovation. Evan is a designer in Number TEN's Victoria office. It is no secret that Victoria, and BC as a whole is experiencing a housing affordability crisis. As of October 2018, the vacancy rate in the capital region was 1.2 percent, and the average monthly rent was $1,170 for a one-bedroom unit (two-bedroom units averaging $1,406). The development of new purpose-built rental housing projects is seen as a major factor in solving this problem. Canada Mortgage Housing Corporation (CMHC) has said that the rate of construction for new rental apartments is at the highest it has been since the 1970’s. The City’s Victoria Housing Strategy 2016-2026 targets 800 affordable rental units by 2026. Number TEN has been in the thick of it, concurrently designing two new affordable rental housing projects on Vancouver Island, both now set to go before city councils for development approval. Winnipeg city council will soon be presented with details of the new residential infill strategy, a guide for development in the city’s existing neighbourhoods that represents an important opportunity to manage higher-density growth and define what our communities will look like in the future. 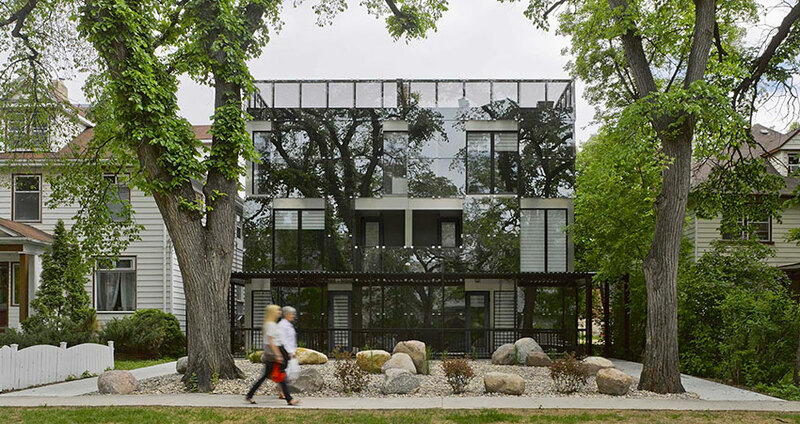 A contemporary infill structure on Stradbrook Avenue shows how modern design and innovation can enhance a neighbourhood. Where the Klondike and Yukon Rivers meet, Dawson City became a boomtown of fortune-seekers in 1898 during the Klondike Gold Rush. By 1900 the muddy tent city had transformed into a prosperous outpost. The Palace Grand Theatre opened in gala style in July 1899. The theatre was a combination of a luxurious European opera house and boomtown dance hall. It was built by "Arizona Charlie Meadows"; a Wild West showman who came to Dawson City during the Klondike Gold Rush. With the gold strike in Nome, Alaska in the latter part of 1899, the excitement in Dawson City died as quickly as it rose. Over the next few years, Dawson City made the transition from gold rush boomtown to a smaller mining community. With the steady decline in population, Meadows sold the Palace Grand Theatre in 1901 for $17,000, less than a third of the initial cost, and the building was neglected over time. Number TEN Inspired! captures the knowledge, passion and ideas of our award winning architects, interior designers and supporting staff, as they navigate through the complexities of the modern design landscape. We are creative problem solvers, advocates for better ways of doing things, and observers of all that is interesting and noteworthy in our field. This blog is our effort to share our knowledge and ideas in a way that resonates with everyone. Whether you work in the industry as an architect, interior designer, building manager, property developer, or are just someone with an interest in creativity and new ways of doing things, this blog has something for you.